We get quite a few qeustions about field trials; how the different types of trials work, how to get certificates and so on. Therefore we’d like to share a chapter from the book with you. Here’s the description of the spaniel trials. The purpose of a spaniel field trial is to show the performance of a properly trained spaniel in the field. If anything the dogs should work even more perfectly since it’s a trial situation and not an everyday shooting. 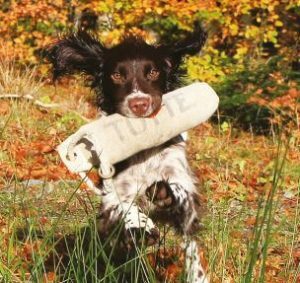 The rules for spaniel field trials vary between different countries, but the basic principles are the same: The dog should hunt and flush game so the game can be shot and then, when cued by the handler, the dog should bring the game to the handler. 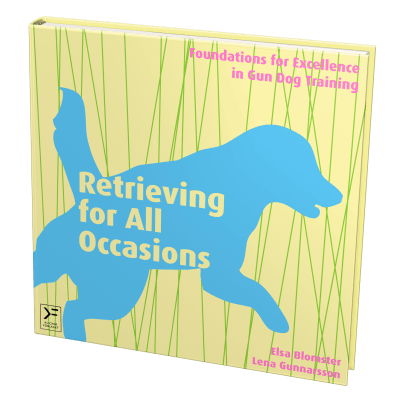 In other words, the dog needs to be properly trained since she will encounter major challenges. During a spaniel field trial, the dog is assessed on her willingness to cooperate, desire to hunt, and ability to retrieve, but also her ability to remain calm and quiet. Some practice trials use dummies rather than live game. Spaniels’ most important tasks happen before the shot, during fieldwork, when the dog systematically hunts and flushes game (in contrast to retrievers, who start working after the shot). 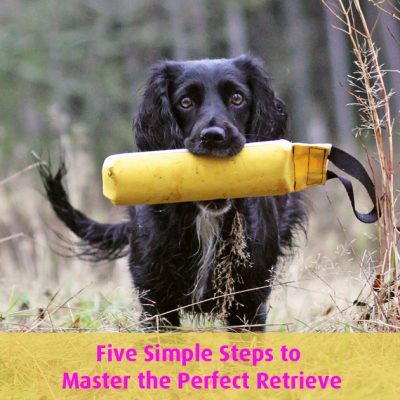 However, spaniel field trials also involve retrieving, most often in the form of marked retrieves. 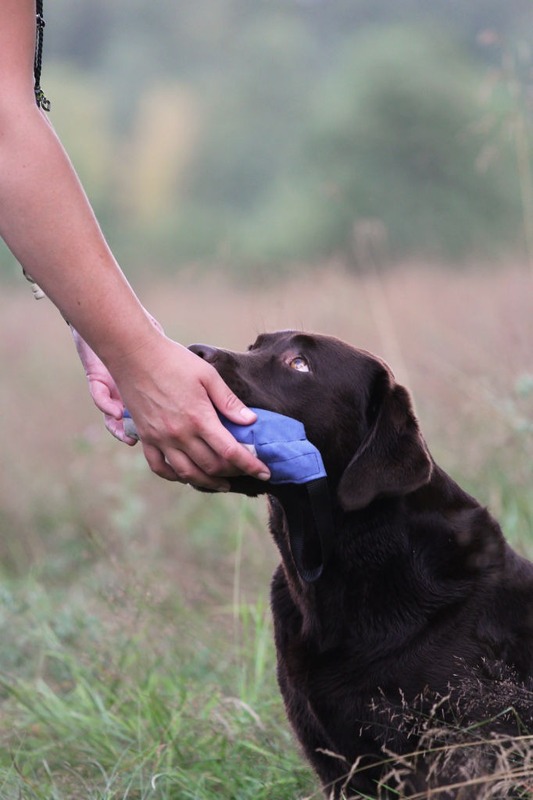 The handler should therefore be able to direct the dog to the correct area to retrieve game she didn’t see fall. During blind retrieves, the dog is sent to a particular area to find and bring back the game. The dog should be able to perform these tasks both on land and in the water. To be able to cover large amounts of ground, sometimes several dogs work in pairs next to each other at the same time, also known as braces. 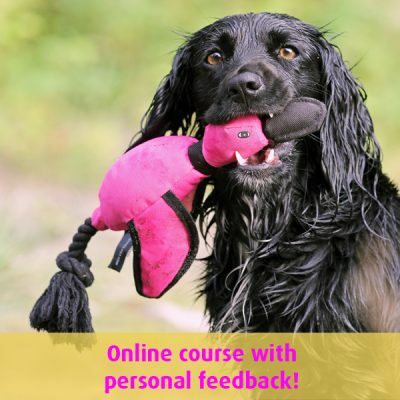 Steadiness is also an extremely important part of spaniel training. During field work, the dog must stop and stay perfectly still when the game is flushed. The dog is also required to remain silent. The spaniel should be able to walk near her handler while other dogs are working and game is shot and falls. Handlers direct spaniels, as they do with retrievers, using cues, hand signals, and whistles. Some of the things the judges will look at are scenting ability, how the dog uses the wind, her steadiness, and proof of a soft mouth. Your dog will be scored on game finding ability, steadiness, style, and retrieving. Many different clubs organize field trials in the United States, but the rules discussed here apply to the American Kennel Club (AKC). The field trial stakes are breed specific, but there are also stakes that allow more than one breed to take part. Dogs compete in a series and at the end of each series, the judges decide which dogs they want to see again. If your dog is to be able to receive an award, she must compete in all land series and if there are any water tests, she needs to run in those too. Both officiating judges must also have judged your dog if she’s going to be placed and/ or receive an Award of Merit. In all stakes, the shots will be fired over your dog and she might be worked up and down wind, and also in water. 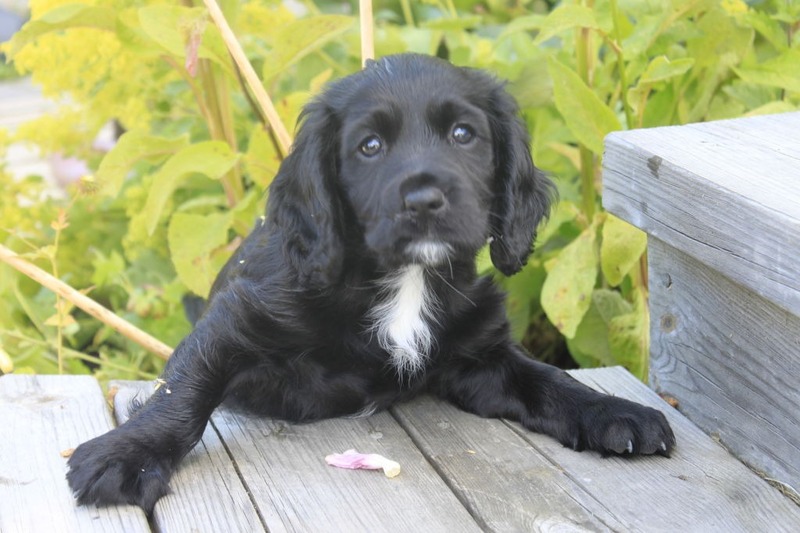 At a spaniel field trial the following are the official stakes: Puppy, Novice, Limited, Open All-Age, Qualified Open All-Age, and Amateur All-Age. For an English Springer Spaniel, a Cocker Spaniel, or an English Cocker Spaniel to become a Field Champion in the US, she must win either a National Championship Stake, two Open All-Age Stakes, two Qualified Open All-Age Stakes, or one of each. Alternatively, she must win either an Open All-Age Stake or Qualified Open All-Age Stake plus ten championship points, which she earns for a second, third, or fourth place in Open All-Age Stake or Qualified Open-All Age Stake with at least ten starting dogs. To become an Amateur Field Champion the dog must win a National Amateur Championship Stake, two Amateur All-Age Stakes, or an Amateur All-Age Stake plus ten championship points. Before an English Springer Spaniel, Cocker Spaniel, or English Cocker Spaniel can become a Field or Amateur Field Champion or win a title, the dog must have shown she can retrieve game from water after swimming. The water test is one or two bird retrieves. The dog will be asked to retrieve cold game, thrown at gunshot, after a swim. Water tests can be held as separate events or in conjunction with field trials. There are both Kennel Club sanctioned and non-sanctioned field trials in the UK, and also separate trials for amateurs. The trials are all run during a hunt with live game, unless it’s a water test where cold game might be used occasionally. 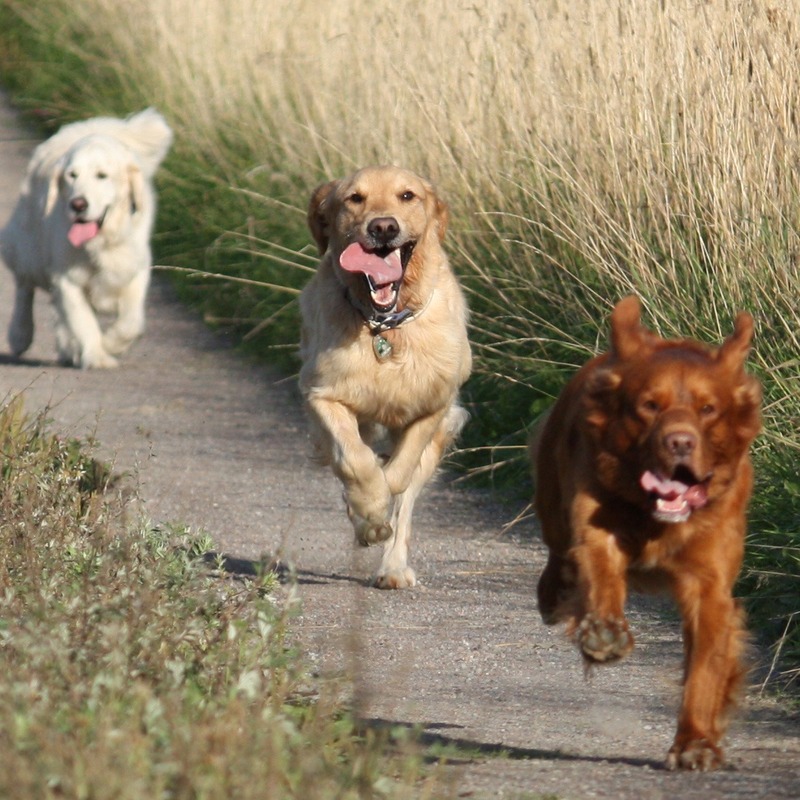 The dogs compete in runs, corresponding to series in the US. At the end of each run, the judges will decide which dogs they want to see again. At the end of the day, the judges agree on a winner of the field trial (if there is a dog that is a worthy winner, otherwise there might be no winner at all). An Open stake is where you can qualify towards the title of Field Trial Champion (FT Ch) and towards being allowed to enter into the Championships or Champion Stake for your breed. There are All Age Stakes open to all dogs of a specific breed without age restriction, Novice Stakes and Puppy Stakes. Cocker Spaniels can earn the title Field Trial Champion if they place first in the Cocker Spaniel Championship or win two first awards in open stakes. English Springer Spaniels can get the title by placing first in the English Springer Spaniel Championship or by winning two first awards in open stakes. Before a dog of either breed can be awarded the title Field Trial Champion, she must also receive a Water Certificate. A water test can either be a separate trial or part of a field trial.